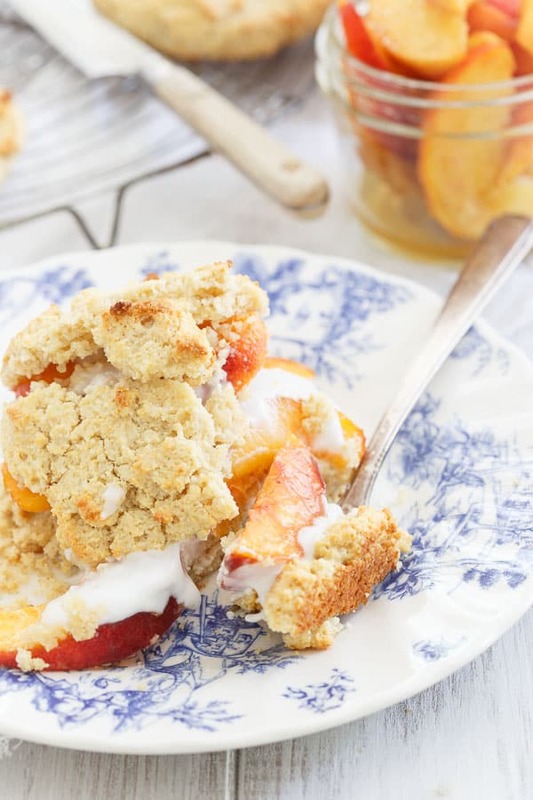 This paleo peach shortcake is a great way to celebrate ripe stone fruit this summer before it’s gone. It’s perfectly crumbly and just slightly sweet like the real deal – you’d never know it was paleo. I really can’t stand the comparison of food to “crack.” From naming recipes with “crack” in the title to saying “those brownies/any other food item are like ‘crack’” just drives me crazy. First of all, I’m betting 99.9% of the people saying this stuff have probably never tried crack (or maybe that’s just me being naïve and hopeful? ), so tell me how they’re supposed to know if that’s even true? Secondly, why the heck are we going around likening something that’s delicious to a narcotic? I get the addiction part of it but I feel like we can do better in picking our analogies, people. That said, peaches are my summer addiction. I love all fruit (except papaya, it smells like cheesy feet to me) but peaches are like in a league of their own. If I had to pick, white peaches probably edge out yellow ones but honestly, I don’t care. I’ll take them in any shape and size; I’ll hoard the heck out of them from June until September and eat them with every meal. Latest obsession? Peach, tomato, and basil salads with burrata. Omg, I die. 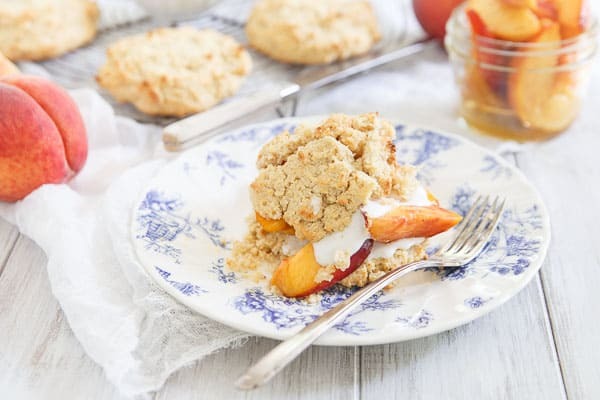 I’ve been wanting to make a paleo shortcake recipe for some time now and peach season seemed like the perfect excuse to finally make it happen. Sorry, strawberries, you’ve been dethroned as the go-to shortcake topping as far as I’m concerned. 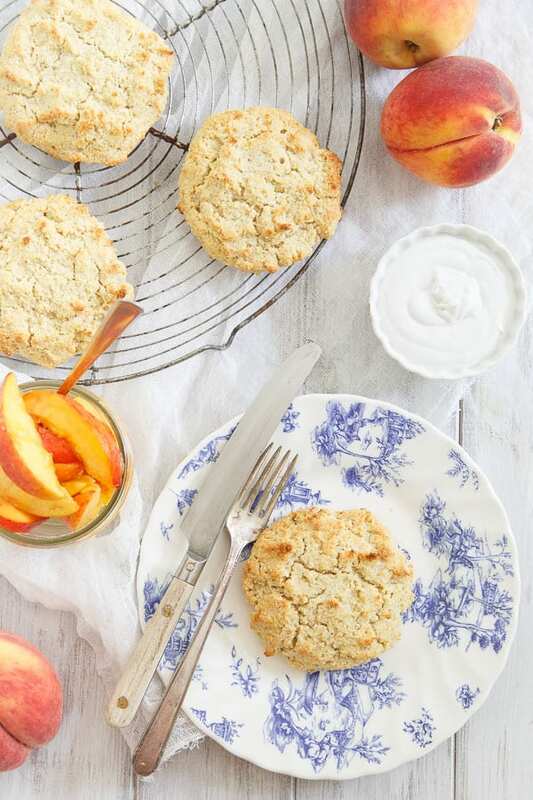 There’s nothing quite better than a crumbly, slightly sweet biscuit topped with coconut whipped cream and simple ripe summer peaches. You might not even need the maple syrup with the peaches if they’re ripe and juicy enough. If so, I’d suggest heating them up in small sauce pot for just a few minutes to break them down a bit. The best part about this recipe is it’s not just a shortcake recipe. Feel free to whip up the biscuits at any time for a great addition to breakfast (with some homemade compound butter maybe?) or leave out the vanilla and serve them savory for dinner! 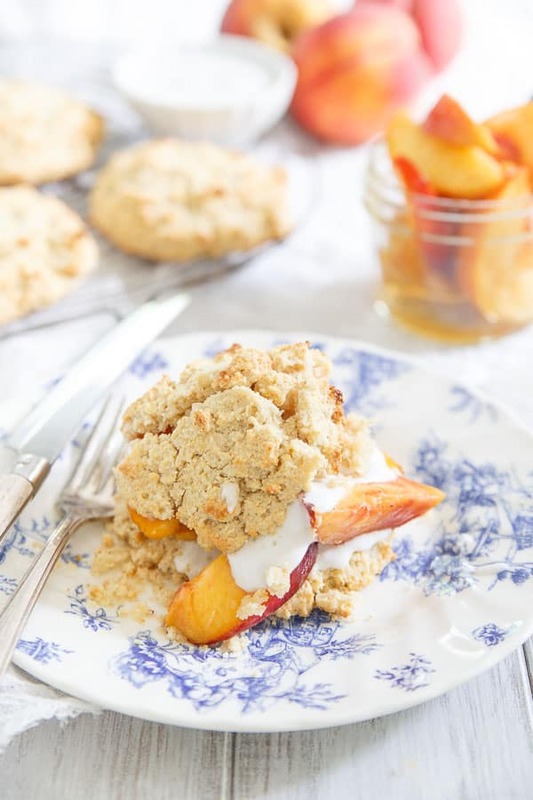 I also shared this paleo peach shortcake recipe over on Food Fanatic, so be sure to check it out there! I started following the paleo diet in July so I can’t wait to try this. I’m in love with peaches too – I hope they stick around for at least a few more weeks! What an awesome looking shortcake. You should make this for tonight….cough cough…..wink wink…. I’m totally with you on the peaches and the “crack” comments. If it were true there would be a ridiculous number of crackheads walking around this world…um no thanks. I love that you are keeping the peaches alive! I’ve started hoarding mine and freezing them for that day in December when I need something peachy! I don’t follow the paleo diet but these shortcakes look guaranteed to please all! Delicious. I will definitely try this recipe! Is there anyone who is on Paleo Diet? I am trying this diet for a month and also I am training but I still don’t see any results. What about you ladies? Thanks for sharing this recipe! These look amazing and I love that’s their paleo! It’s not summer without peaches! This looks like the perfect recipe for a cookout!